St. Paul's cathedral - Lanes and alleyways: Melbourne art culture - MELBOURNE MEMORY #3: TRAM RIDES - Queen Victoria's Market - Eureka Sky Deck 88 - Captain cook's cottage - Flinder's street station - Yarra River - MCG - Federation Square - Cuisine - Extras. I wonder how many tourism boards in the world today promote one of their modes of transport as a stand-out feature in their travel advertising. Yet, Tourism Victoria is one of them. I had fallen for them the moment I had known, putting tram rides in my memory list, one of the iconic 'things to do'. Home to one of the most extensive tram networks in the world and the only one surviving in Australia, Melbourne connects almost everything of itself through one of its most popular resident – the tram. I got a whiff of its popularity the moment I stepped out of the airport, into the city. A big mesh of electric wires ran overhead and a line of intersecting track lines ran below; within these two life giving support parameters was the tram, Melbourne’s very own commutation lifeline akin to the Mumbai local or the Tokyo metro subway. Besides the trams, there are other modes of transport too like the taxi, the trains and the buses (the Melbourne Visitor Shuttle is great!) but nothing beats the tram when it comes to that number one spot. Fairly speedy and easy to figure out (of course, with a bit of help from the internet and the locals), trams command priority by all the other vehicles on the road – a clear indication that trams are the hero here – they rule! And you can’t help but fall in love with them for all that they will be doing for you, for all the time you are there. All through my stay in Melbourne, trams were not just a mode of transport for me. They were a friend; always there for company, by my side, taking me to places, some heard, some unheard and serving me with a smile. 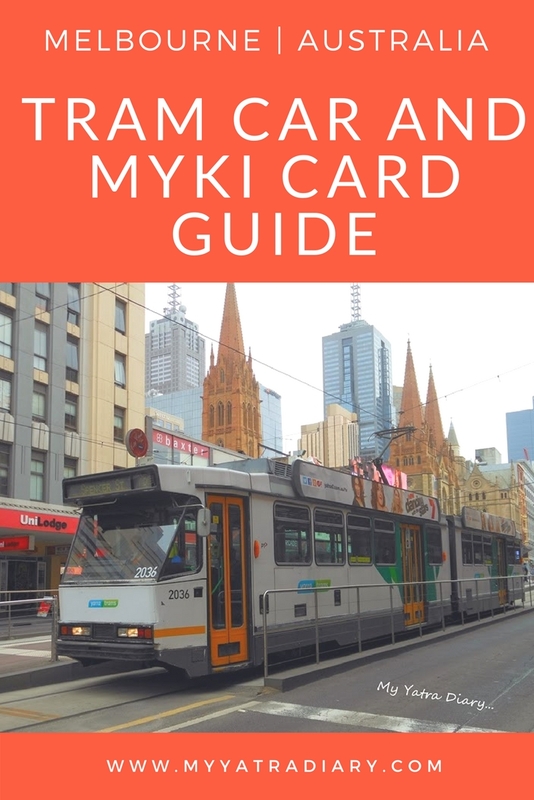 Below are my observations, my very own personal guide for all those travelers out there, planning for Melbourne and looking to discover Australia's second city through it's most beloved local - the tram. A layman's guide for using trams in Melbourne! 1. What are the things to be kept in mind before stepping out of the hotel? Look out for the name of the street you are headed to. That’s your clue. Then, check this link – Journey planner from Public Transport Victoria. It will give you a detailed route to the place you want to visit complete with the tram numbers, travel time required and the boarding and alighting stations. Alternatively, you can ask the hotel staff. They will check it out for you. In any case, it is always good you know your tram numbers in advance, that is, before heading out into the city from your hotel in the morning. It would be reckless on your part if you were to rely only on the locals outside to give you all the information that you need. Tip: Know your streets. You can keep a tram map handy at all times although it didn't help me much. 2. How to figure out the tram stop? Sign posts like these indicate tram stops, displaying a map, route number and a timetable. These are scattered amply all around the city with majority of the significant ones well built with a platform, roof and seats for the convenience of the traveler. You can also find station guards (spot him in orange in the picture above) at some of these stops which makes it easier for you should you have any queries to ask. Route numbers and destination name are also displayed on the incoming tram. Tip: Check and confirm your tram number before stepping in. 3. What is the whole fuss about Myki cards – the ticket to the tram? It’s true, myki’s are confusing, for the travelers and the locals alike. But it’s necessary to buy yourself a myki card, a reusable smart card, before you can hop on to any one of these trams unless you want to travel with the fear of burning a huge hole in your pocket as fine. Myki check machine: Tells you all about it. Initially, that is when you are just starting out with the tram, the whole concept of myki card might just pop up as a bummer. Don’t worry though. You are not alone in this. As I said, no one really understands it. The good thing about it is that it works not only across the trams but also across the buses and the trains. Tip: Do not try figuring it out in-depth. Give it time. A little bit of travelling should iron out the first few impediments as it did for me. 4. Buying myki and topping it up with cash. You can find ticket window booths at a majority of train stations specifically set up for selling these out. I bought my myki from such a window near the Flinders street station. Or you can also get one at the 7/11 dollar shops. A variety of packages are available for topping up your myki. Choose wisely depending on the number of days you are in Melbourne and how you plan to spend them. I was in Melbourne for 4 days and topped up my Myki for 7 dollars every morning. This unlimited ticket, valid for the entire day and across all trams covering a whole lot of the city of Melbourne – all 4 directions and center, saved me a lot of money! Tip: Look out for the myki sign. 5. Short on money? Take the City Circle Tram No. 35 instead – it’s FREE! As travelers, we often budget travel and sometimes these modes of transport can take a toll. Melbourne has a fix. It has something which is absolutely free! The city circle tram, it circles the central part of Melbourne, grabs eyeballs for being oh-so-vintage and to top it all – it is completely free! Before taking a seat, take a map (available inside) for yourself so that you can follow the running commentary on the city attractions in a better manner. Information: The route runs along Flinders Street, Harbour Esplanade, Docklands Drive, La Trobe Street and Spring Street. So be prepared to walk around a bit if your destination is not one of these. Trams run in both directions every 12 minutes from 10.00am to 6.00pm Sunday to Wednesday, and 10.00am to 9.00pm Thursday to Saturday (except Christmas Day and Good Friday). The City Circle Tram is not wheelchair accessible. 6. Grab a window seat - Enjoy the ride! I always took the window seat, my favorite when travelling in the trams and the trams always kept their promise of opening up a whole new world for me, chaotic on that side yet silent in mine. I liked it that way. I loved observing Her in a tranquil and moving way. She - bold and quirky. She - traditional and quiet. She - graceful and charming. So often, these were also the times, I truly felt of being in a foreign land, a bit hazy, a bit muddled but still very much alive, still very much breathing, for me to feel and figure. Reflections: She loved admiring herself in the mirror. ... seemed like a dream. through the window of my tram. Grab a window seat! Trust me, there are fewer ways better to see the city than through the glasses of a tram. Services run regularly from 5.00am to midnight Monday to Thursday, and to around 1.30am Friday and Saturday nights. On Sunday, trams run 7.00am to 11.00pm. Many tram services link to bus and train routes. Have you been to Melbourne and have some further tips or guidelines to share? Lovely glimpses into the city and the cathedral. Perfect post for any traveler to Melbourne. Myki check machine is a cool gadget. Arti, Another wonderful post from your Melbourne yatra. Great writeup, Thanks for sharing. Nice to saw your wonderful photos . If at all I go to Australia am sure the myki and tram no 35 will be very helpful ! What a wonderful post and great information. Trams travel is really fascinating - you travel at a slow and comfortable pace and allow the beauty of the surroundings to sink in. Kolkata is one of the few cities in India which still runs trams - but these are old outdated and dilapidated. Σ΄ευχαριστώ για το τόσο ενδιαφέρον ρεπορτάζ!!! What a wonderful post and great information..it shows uve done ur home work well before actually hitting the road. A perfect traveler. Each click is so good..
Oh yes. Kolkata - I remember my fascination for the trams whenever I traveled to that part of the country. I wish we also looked after our trams well. Thanks for the San Francisco bit, Prasad. Never knew about them. Arti, How well you narrate and give details. Kudos. Great tips and information, Arti. I remember riding those trams when I was there and it made Melbourne even more charming. Their trains were great too. Your pictures tell me that Melbourne is a beautiful place and that you had a fantastic holiday--envy you!!!!!! Do the trams have a visible effect on the traffic?Delhi had trams long back. A good question, Induji. The trams beautifully blend with the rest of the traffic, they are vehicles with a certain bit of charisma so they also command some attention. But never do they pose any kind of hindrances when it comes to traffic and that I think, is one of most commendable point in the pocket of the government. What a wonderful post, I love trams ! We still have trams in my home country as well by most of the time underground. I think it is very charming taking a tram in a city centre, great tips ! Great post! One of the best things about Melbourne is the trams, they are so useful and they give the city a little more charm to it. Love Melbourne, it is a great city to visit and I believe to even live. (Even though I am a Sydney girl at heart :-) !! by the way, found your blog through Eli's!! Not a bad old town at all! PS: I think a lot of people get over excited about the Myki - I got one the second day they were available! I did not know Melbourne was such a beautiful city. Looks there are quite different colors and culture in the town. I am enjoying your travel in my room! My mother 94 is not being in good these days, so my comment for Green Tomato sometimes has to be closed. I am a late visitor, Sorry. This post will be very helpful to me whenever I visit Melbourne. Great detailed post Arti :) I really love this new look that you gave to your blog. Wonderful.. I'm sure the set is worthy of a book.. I will sure consult these posts when i visit Australia I read the others too..!Great work. Arti..
How clean and safe it all looks. Thanks for another great journey and to think we didn't even need a ticket. Tram is an environmentally friendly vehicle. There were many trams running in various refions of Japan in its good and old days, but its rails were replaced for the more space for cars. I’d like to enjoy architecture-viewing from the window of free train. No. 8 photo is awesome! Australia is one of those cities which offer awesome public transport system & I am fan of such system. It's a great way to see the place. Wow..Nice captures and narration.. Great post.. Very informative and thanks for sharing !! This is a wonderful experience. Wow what a great tour.I really inspire from your tour .Its really a great tour and very nice capturing you take and very beautiful places you travel.I like your blog and your story of travel. I,m a tourist by profession but i wish to travel this type of tour which you travel.I love this.Thanks for sharing. That would be most detailed post about trams in Melbourne I guess. Would be very nice for the first timers there. This is one of a few posts you made about Melbourne and I am pleased you liked our city. While there is much to complain about every day, I rather like my city. A perfect travel guide! I was overwhelmed with the detailed trip you had in Melbourne. You're images are great, letting others see the real beauty of Melbourne. I'm telling you, you can always come back to Melbourne. Great job in this blog! I love reading your blog and am going to travel to Melbourne in October too! I am still confused on the types of myki passes they have. If I were to purchase a day pass, will I be able to board train and buses besides trams? Can I purchase more than 1 day pass for my whole trip? Loving the details and the tips here! These small details are what come handy when traveling!